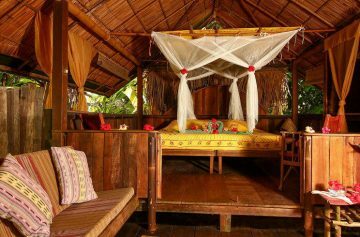 Beautifully handcrafted jungle cabins and tents near Corcovado’s rainforest and Carate beach! Here at Finca Exotica ecolodge we offer a range of private deluxe rental, jungle cabins, and tiki tents. 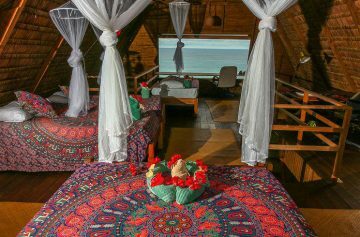 We have an accommodation option for everyone´s needs here on Playa Carate! Depending on your budget, you may choose our more luxurious option with private dipping pool ´Rancho´, or for those looking to get back to nature camping in style, you may prefer our tikitent option. All options come with open air showers. The outdoor cool water shower is a truly invigorating experience which you will enjoy day after day in the humidity of the jungle paradise. We provide complimentary soap and shampoo for all guests staying in our cabins. The brand we use is eco-friendly and bio degradable, ensuring minimal impact on our surrounding natural environment. All of our cabins come with lighting, but we also offer candles to our guests to really set the mood. If you need to charge any camera batteries, please feel free to bring them to Casa Grande if you do not have a charging socket in your cabin. Please remember that when you choose to stay here at Finca Exotica Eco Lodge, you are choosing to immerse yourself in nature. We use limited walls in our cabins and so expect to be at one with the wildlife around. We try to have a minimal impact in the surrounding environment and build what we can in a sustainable way. 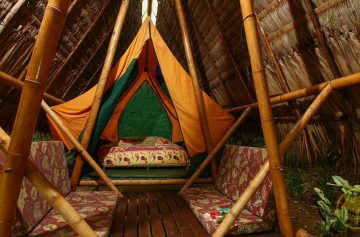 We are not a 5 star resort, but rather a small eco lodge inviting the more rustic traveler wishing to leave nothing but footprints here on the Osa Peninsula.